Alice Herz Sommer is a survivor of the Theresienstadt concentration camp whose husband was murdered in Auschwitz. 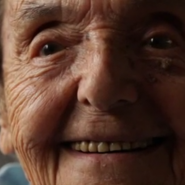 At 109 she is the oldest living Holocaust survivor. When asked “What is the secret to you feeling so good at your age?” she responded: “[I’m an] optimist. Looking for the good! Life is beautiful. Have to be happy, to admire, to thank, to be thankful that we are living. Wherever you look is beauty. I see beauty everywhere. I know about the bad things, but I look [for the good things].” This is a video to watch and re-watch every single day.